It's the third week of the year, how is everyone holding up? I hope you all are keeping the same momentum going as when you first started. Whether it be working out, your new hobby, or being a better person, remember to stay strong and keep going! We're not perfect but we sure can create some magic when we keep pushing ourselves to the fullest. I'm definitely not perfect and I have my off moments. It's very easy to compare yourself to others when we're surrounded by social media. What we forget is that just as we are, everyone else is displaying their greatest moments on social media. It's easy to get caught up and compare their life to yours. But trust me, comparing apples to pears doesn't get you anywhere but the negative dump. You must avoid comparison AT ALL TIMES. I know I sound like a broken record sometimes but it's something we must hear over and over. Your journey is your own, and you are exactly where you're supposed to be in this very moment. You don't have to be doing what the next person on Instagram is doing. What is meant for you will be meant for you regardless if you're trying to catch up with everyone else's lives. You have to remember to focus on the most important person, YOU. You'll go as far as your mind allows you to. All that focus and attention you're doing on comparing yourself could be used for some positive affirmations. Our journeys are all different and that's something we have to constantly remind ourselves everyday. So what if the next girl is going on a vacation? That doesn't necessarily mean that you're not; just at this point in time, there is something else meant for you. Remember to slow down, take a breathe and continue focusing on your path and your vision. Set your goals and standards solely on yourself, get that tunnel vision going, and remember that you are exactly where you're supposed to be. Your life is all about YOU for a reason. 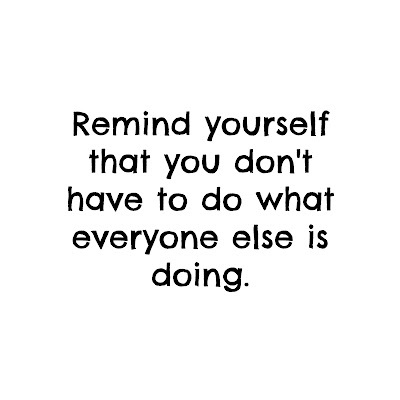 You're an individual, stay that way.